Because of the recent political unrest in Bangkok, we have decided to move PICMET ’10 to Phuket. It is an idyllic, subtropical island in southern Thailand about an hour’s flight from Bangkok. Phuket has an international airport with non-stop flights to and from many major cities around the world and is served by a number of airlines. There are numerous daily flights from Bangkok. 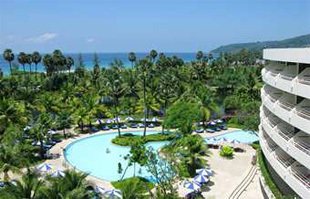 PICMET ’10 will be held at the Hilton Phuket Arcadia Resort & Spa. A block of rooms has been reserved for PICMET attendees at the special rates below. The rates are for single or double occupancy and include full breakfast when reservation is made by cliking the on-line reservation button below. The cut-off date for the reduced rate is July 10, 2010. Note: The rates above are only valid if you book between July 10 to July 31, 2010. If you have already booked at the Millennium Hilton Bangkok, please cancel it and re-book again at the Hilton Phuket Arcadia. Unwind with a traditional Thai massage in the Spa at the Hilton Phuket Arcadia Resort & Spa . Cool off in one of 3 pools, take a free scuba diving class or just relax to the sound of the waterfalls. This stunning resort, set on the sandy Karon Beach, stretches over 75 acres of lush tropical gardens. The very best Phuket attractions, including Fantasea theme park and Chalong Temple, are just a short drive away. Sample fresh seafood and award-winning cocktails at Sails restaurant in the Hilton Phuket Arcadia Resort & Spa. Or go local at the romantic Thai Restaurant. The Hilton Phuket Arcadia Resort & Spa has 9 meeting rooms and a marquee for 5-1200, a business center and wireless internet access in public areas. 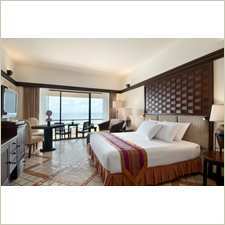 All of the Hilton Phuket Arcadia Resort & Spa rooms have balconies offering spectacular views. 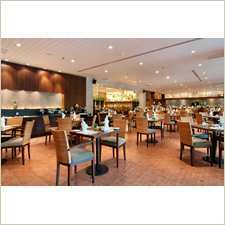 Location: Travel to the Hilton Phuket Arcadia Resort & Spa. A 45-minute journey from Phuket International Airport, this 75-acre resort is next to Karon Beach and surrounded by green mountains.